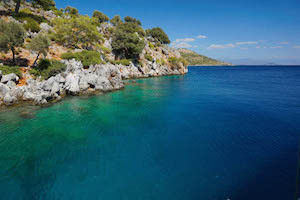 We’re aboard the Blue Pearl on a route along the Turquoise Coast known as a Blue Cruise. Our vessel is a traditional Turkish gulet — a two-masted, eight-cabin wooden sailboat from the southwestern coastal region of Anatolia. The captain rings a bell, and like little Pavlovian creatures of the sea, we clamber back up the boat, gather around a family-style table and drool over the feast before us. A Turkish kahvalti is arguably one of the best breakfasts in the world. It typically consists of tangy beyaz peynir cheese, olives, eggs, tomatoes, cucumbers, fig marmalade, village honey, freshly milled olive oil, spicy meat, and plenty of bread to sop up all the tasty goodness. Everyone on the boat (except me) is Turkish and only a few speak English, albeit limited. I couldn’t have wished it better. There’s nothing like listening to the easy conversations of locals over a meal, and it’s so much more entertaining to find ways to communicate without the help of versed translators. Whenever I do ask a question everyone stops everything and looks at me (which has taken some getting used to), trying to understand my words and then answer. Sometimes they’ll look to others for help or hold up an object and point. Always, they teach me a word or two in Turkish. But the quickest way into the hearts of locals anywhere is to find out their beverage of choice, bring it to the table, and share it with them. So, during a stop at a small fishing village, I picked up a nice bottle of raki — the Turkish national drink made from distilled grapes and aniseed. Whoa. If you like absinthe or ouzo, which I do, you’ll love raki. Şerefe! Our itinerary takes us from Fethiye up the coast to Bodrum, and includes a visit to Dalyan for an up-close experience in antiquities. Smaller boats take you down a brackish estuary to the ancient seaport of Kaunos. 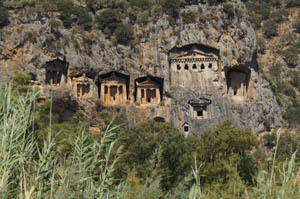 Along the way, on sheer cliffs high above the river, are the facades of Lycian era rock tombs, circa 400 b.c. Inside the ruins of Kaunos you can roam freely without the crowds of the more heavily visited sites in Europe. Depending on the route, you may find yourself swimming within the ruins of Cleopatra’s Baths, or sunning on a golden beach where the sand is said to have been shipped over from the dunes of Egypt by the very same queen. This area was, after all, given to Cleopatra as a wedding gift from Marc Antony. Or you can venture further into history and hike around the Eternal Flame of Olympus, sail around the Cycladic islands, walk with wild goats on the Lycian Way, or snorkel in the sunken city of Simena. Cruises are seasonal, April through October, with high season being July through September. Seven-day trips start at about $450 per person based on double occupancy, and include all meals. There are also three- and four-day cruises if a full week doesn’t fit in your schedule. 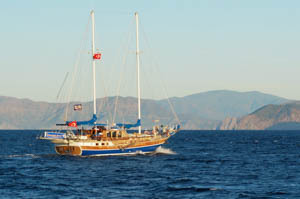 Check out Blue Cruise Bodrum at www.bluecruise.org.